The next issue of the International Reading Association’s The Reading Teacher includes a column that I wrote on ” Multimodal Composing and the Common Core Standards”. 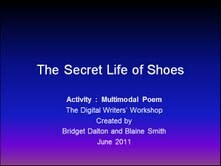 In the column I describe a multimodal shoe poem project . To complement the article, I’ve pasted below the PowerPoint slide presentation that Blaine Smith and I created to introduce the activity and scaffold the process. Feel free to use and remix this for your students. If you try it out, it would be great to hear from you via a post to the blog or an email (bridget.dalton@colorado.edu). Why start with Shoe Poems? 2. 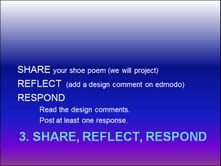 Shoe poems offer multiple entry points – they can be concrete or abstract. 1. It’s an easy to use composing tool that allows you to build with image, sound and text. 2. You can build on students’ prior experience with the tool. 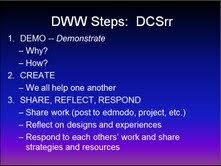 Blaine Smith and I have been developing a Digital Writers’ Workshop instructional approach (Dalton & Smith, under review). For this project, we used a Demo, Create, and Share, Reflect, Respond structure, but there are lots of different ways to be successful. Think about how you teach writing and adapt your approach so that it reflects multimodal design. Here we go! To begin, awaken students’ excitement by ‘showing and telling’. 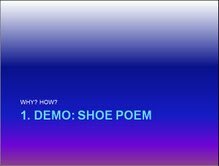 What is a shoe poem? Why would you want to create one? I try to use at least 2 examples and encourage students to come up with their own creative approaches. 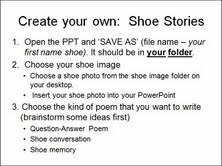 These 3 examples show different types of shoe poems: question-answer; shoe memory; and shoe conversation They offer choices and also show different styles of multimodal design. 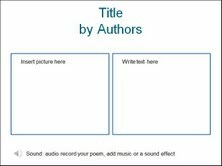 Tell students the blue box is information to help them – it is not part of the poem! 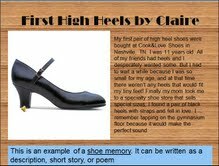 For this shoe memory, Claire selected a wooden floor background and a tap dancing sound effect to complement her written memory of the thrill of wearing her first pair of high heels when she was 11 years old. This last example is likely to appeal to kid interested in sports. It illustrates a different visual style and how to use the audio-record tool to make the shoe conversation can come alive with dramatic dialogue. 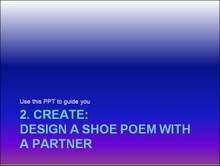 Now for the fun part – create your own shoe poem. I often have students work with a partner so they can benefit from the talents, knowledge and skills that each brings to the task. Working with a partner also requires that they talk about design decisions and negotiate their collaboration. 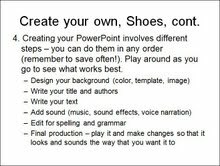 I use PowerPoint to provide the directions for the activity. I project it on the screen while students are working, and put it in a folder on their computers so that they can consult it as needed. I do this to avoid repeating directions! Since this was an introduction to multimodal composition for these students, I scaffolded it by putting a folder of shoe images on their desktops. Of course, if they had a special shoe in mind that wasn’t in the folder, they searched on the Internet. While there are steps involved in creating and producing multimodal pieces, students can change the order as needed. This outlines the overall process; schedule intermittent sharing sessions so that students can present and get feedback as they go along. Again, since these students were new to both shoe poems and this type of multimodal composition, I scaffolded it with a template they could use, if they wanted. I remind students that it is one way, and they may have a different way that will work better for them. The Share, Reflect, Respond stage happens during the process to get feedback, and at the end, to celebrate. Students are more influenced by each other’s work than they are by teacher examples! I combine students’ class presentations with some kind of publishing. Audience is important; the Internet offers multiple options for publishing student work. I also make color-printed hard copies when I can. And that is a wrap, my friends! Hope to hear about the creative work you are doing with your students to transform them into designers and multimodal composers!